Everyone knows about this classic/iconic Disney treat! And I doubt there are too many theme park guests who haven’t had at least one. Is it tasty? Yes. Is it good for you? Sure, why not. Is it addictive? Yes. Should you buy a box of them and smuggle them back to your home State or country? Sure, why not. Ah, that first bite! It’s like a Disney rite of passage. But do you bite into the left ear or right ear first? Scientists have spent millions conducting an exhaustive study on that conundrum but as yet have only determined that biting into too many Mickey Bar ears causes stomach aches. Money well spent people! Fun Facts: There are some things you may not know about this funny-shaped treat. 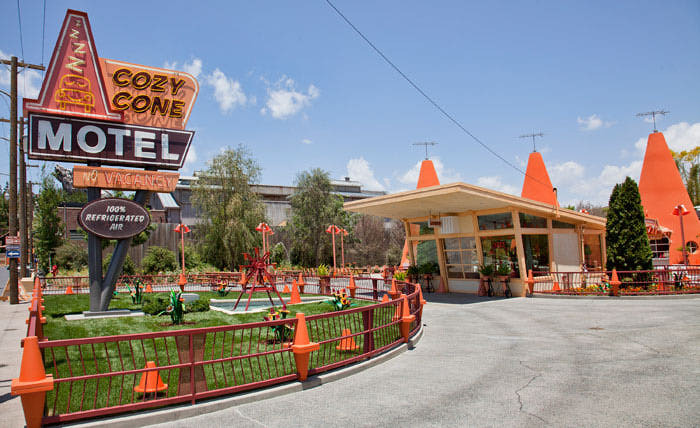 And we end this loop just as we should all end each and every one of our Disney vacations: With a Mickey Bar! Hello everyone, and welcome to this month’s Magical Blogorail post, were we explore some of the incredibly delicious frozen fruit snacks that can help you stay cool in the summer heat at Disney! Picture this, if you please. You are at Disney’s Animal Kingdom park, it’s 100 degrees in the shade, the humidity is easily 80%, and you are looking for anything to help cool you down. Can you feel the heat, the sticky humidity, is it driving you crazy right now just imagining it? 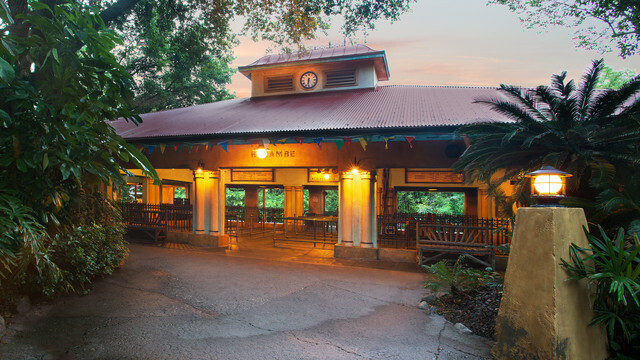 Well, one thing your family doesn’t do very often is go to Rafiki’s Planet Watch, simply because it’s kind of out of the way, but you decide to go because you’ve heard that it has air conditioning, and there is a train to ride, after all, and fans, etc. 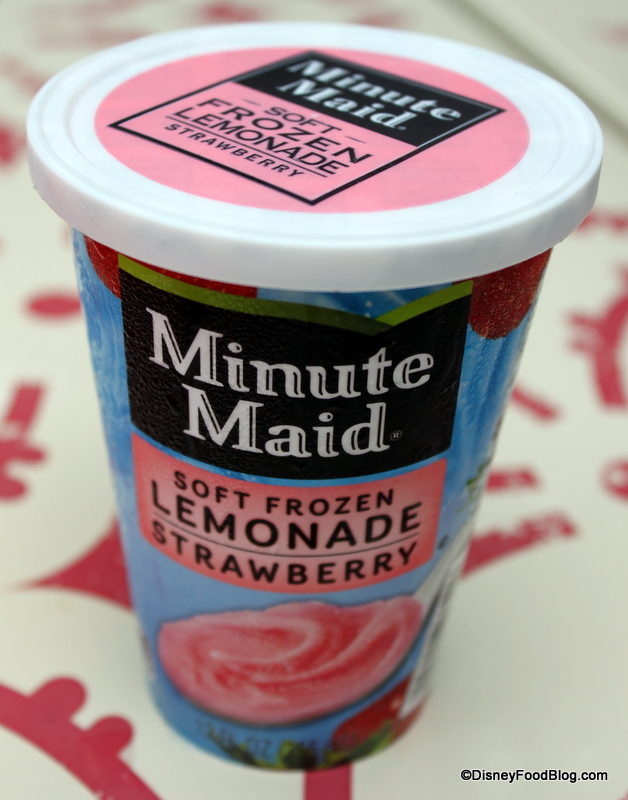 So imagine a day as hot as that, and as you are approaching the Conservation Station, you see a small snack cart selling the Minute Maid Frozen Strawberry Lemonade. 12 ounces of frozen deliciousness, only $4 at the time (a snack credit for those on the Disney Dining Plan). Soft enough to spoon through and enjoy, big enough to share, yummy enough to give a good treat, and cool enough to lower the internal temperature a bit. In short, a great treat for a hot summer day! As I was preparing to write this, all of a sudden I had thought — does this frozen treat count as a frozen fruit snack? Well, when I researched it, I did find that the Orangeade that you can get contains 28% fruit juice, but I couldn’t find any word on the Frozen Strawberry Lemonade, so I’m not certain. However, here’s my thinking on it — it tastes great, it is fruity, so to me, it counts, even if it’s not a frozen banana or something like that. In the 100 degree temperatures, I guess it’s a matter of semantics, but that’s the way my mind operates at times. So tell us, please, what are your favorite frozen snacks, and why? I’d love to hear all about it, please let us know in the comments, and thanks for stopping by today! Dream Disney Scents is the name of my Scentsy Site! Let’s bring together our love of Disney and the love of Scentsy! Hello everyone! As part of the evolution of our site, I have decided to take on the roll of becoming a Scentsy Consultant! My niece’s Leslie and Stephanie are both consultants, and after talking with them, I think that I can bring together two very well known brands — Disney and Scentsy — and combine them to help you all out even more! Picture this, if you will: You know that I have my Disney fan blog, and that I am a travel agent with Pixie Vacations. Because of this connection, you come to our blog, and reach out to me to help you plan your dream vacation to Walt Disney World, where you want to stay at the Beach Club Resort. We plan your trip, it is full of a lifetime of memories for you, your family, your children, and you know that you will want to remember them for years to come. Well, with Scentsy, you can do just that! 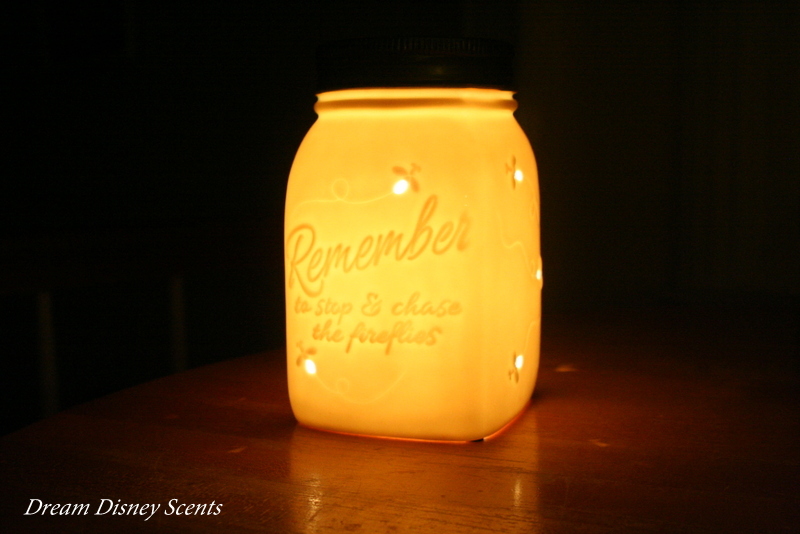 You can get the Key Largo Nightlight warmer, couple it with the Beach Scentsy Bar, and voila! Whenever you smell that wonderful aroma, your mind takes you back to your Disney resort, and you remember strolling out on the Boardwalk near sundown, enjoying the view of the lights over the water, the sound of the music coming from Jellyrolls while you, your husband, and your children make your way to Beaches & Cream to enjoy some delicious ice cream! If you are interested in all of this, I invite you to take a look at my Scentsy personal website, called Dream Disney Scents! I have a launch party starting up tomorrow, but you can still take a look at the site and see what piques your interest! Thank you in advance for taking a look! With all that being said, I think I’ve got to make my own Disney plans — and also think about which scents will go best with the resort we choose! I’ll see you…at Disney, and at Scentsy! The smile on River’s face speaks volumes about how incredible this treat is! Image courtesy my friend Neal! 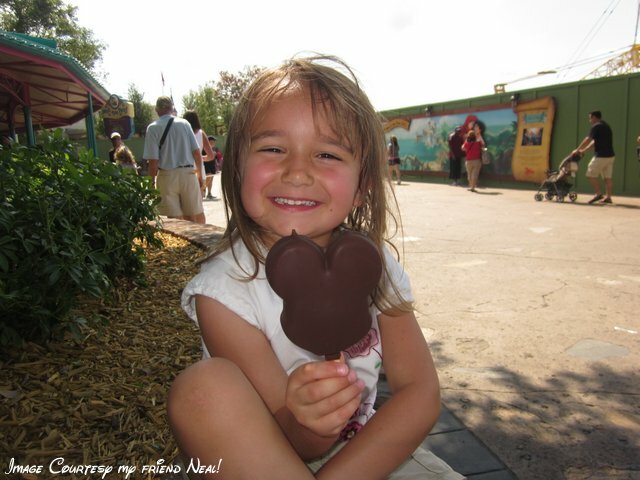 Today we are taking a look at my wife Cindy’s favorite Disney treat — the Mickey Premium Ice Cream Bar! Shown here with our friend River, this delicious treat has been known to put a smile on even the grumpiest dwarf! You can get them at almost any vendor spot in any park, but perhaps the best place to enjoy them is as a dessert at Mickey’s Backyard BBQ! They had a freezer filled up with them, you could have eaten as many as you wanted! Not that I would do something like that, mind you — but you could have! What do you think of this treat? Where does it rank in your list of favorites? Do you like the Dole Whip better than this, or how about my favorite, a freshly popped bag of popcorn? Let me know in the comments, please, and thanks for stopping by!